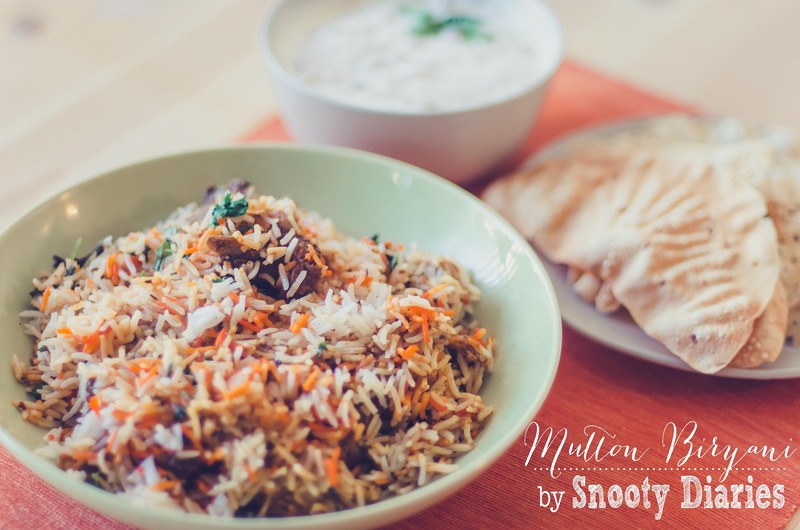 Mutton Biryani … do I need to say anything else. It is one of the most popular Indian recipes which people relish. I for one don’t know when to stop once I start eating it. I had been after my mother-in-law to give me her secret recipe which has been passed on for generations in our family. Since she is in India and am here in the US, she wrote me a detailed recipe so that I could get the proportions and the technique exactly right. It took her a while to translate cooking-by-gut approximations into a precise step by step guide for me. Once I got the recipe I went on a hunt to get good quality mutton. Goat meat isn’t very popular in the US; very few stores have it and if they do, it’s pretty expensive. I did a little research and found this store owned by an Indian in the bay area. I paid $17 for 2 lbs, which is a LOT, so I was praying it better be worth it in the end. This recipe, is a ‘No-Shortcut’ recipe for an authentic Lucknowi biryani ( If you ever go to Lucknow, I would recommend going to Lallaji Biryani place in the Chowk to get the best biryani you would have ever eaten). This is one recipe that I’m unwilling to share due to its family value, but am posting a link to a recipe which is very close to the one I followed. This entry was posted in FOOD, indian, Recipes and tagged Biryani, Cooking, home, India, Lamb and mutton, Lucknow, Mutton Biryani, World Cuisines. Bookmark the permalink. Very , Very Well done – as I said – you did it ! An experience worth the effort ……………………. need I say more………………?